In August of 2001, we discovered cruising. A number of our friends and relatives had gone on cruises and really enjoyed them. However, we had never considered ourselves to be "cruisers", and hadn't given a second thought to cruising ourselves. This all changed when I won a 7 day Alaska cruise for two. Marj and I signed up for an August sailing with Princess and just loved it. After the Alaska cruise, we immediately signed up for a November Western Caribbean cruise with Holland America. It was also terrific. We were hooked. Since then we have done numerous cruises and loved them all. 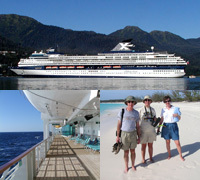 The links in the sidebar to the left will take you to reviews of our past cruises. Half of the fun of cruising is planning the cruise (well, maybe 1/4 of the fun?). 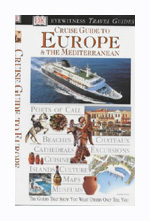 There is a lot of literature available to help you decide where to go, which cruise line or ship to book, and which excursions will best suit your interests. Most of the big travel guide companies (DK Eyewitness, Frommers, Fodors, etc) provide annual reviews of the cruise ships and destinations. 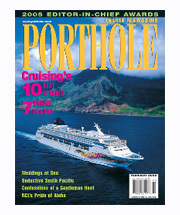 One publication that we have really enjoyed is Porthole Magazine. It is a great way to see reviews of the latest ships, ports, and happenings in the cruise industry. They also publish a fantastic calendar. The pictures are amazing. For an expose of the cruise industry giants (Carnival, RCCL and NCL), be sure to read Devils on the Deep Blue Sea by Kristoffer Garin. It's a real eye-opener. Cruising is a very personal vacation. There are so many things to experience and we all have different interests. The following tips are based on the things that are important to Marj and I, so may not apply to everyone. Book early - As the cruising population continues to increase, the cruises in capacity restricted areas (ie. anywhere but the Caribbean or trans-Atlantic) tend to fill up quickly. If you hesitate and leave the booking until later, you will find that the "good" cabins are all gone and the prices have gone up. So, look at booking 10 to 12 months ahead of the cruise. You can always have your deposit refunded or moved to another cruise, and if the prices happen to go down (like in the old days), the cruise lines will honour the price decrease. Book directly with the cruise line - Unless you can find a travel agency that either beats the price of the cruise line, or offers onboard credits, it is usually better to deal directly with the cruise line. We've found them to be responsive to changes (such as price decreases) and easy to work with. If you book through a travel agent (TA), then you are one level removed from prices rebates, senior's discounts, etc. Try different cruise lines and ships - So many cruisers latch on to the first cruise line (or even ship) that they sail because they have such a wonderful cruise vacation. Don't do that! It really limits your choice of itineraries and cruise experiences. There are so many wonderful ships out there. Don't miss the opportunity to try at least a few of them. Frequent Cruiser Programs aren't that great - Most cruise lines have a frequent cruiser program (Captain's Club, Captain's Circle, Mariner's Society, Crown & Anchor Society, ...). The best perks are the ones that either save you money, or make your cruise more comfortable. Most of the offered perks don not fall into either of these categories. If you read the fine print, about half the useful benefits come after 1 cruise, and the rest after 5 cruises. Perks of note are free internet on Princess (5 cruises), room upgrades on Celebrity (1 cruise) and free air deviations (RCCL and Celebrity after 5 cruises). Never let these perks get in the way of the previous point - try different cruise lines. Note that Celebrity and RCCL prorate credits based on the length of the cruise (ie. a 12, 13 or 14 day cruise counts as two cruises). Princess counts a cruise as 1 cruise, even if it's 105 days long. Here are some more cruising tips, not related to booking. Pop / Soda - I really enjoy Coke or Pepsi, especially after a gym workout. On our first cruise, I was amazed that soda pop was not included in the price of the cruise, and that a "soda card" was expensive. And the card was only good for soda fountain pop rather than canned pop. Since then, I always buy a case of pop before we board and carry it onto the ship. Once in our cabin, I stock the little fridge. Note: Princess provides an empty fridge, which is great. Celebrity, HAL and RCCL prestock the fridge with expensive drinks, so call your room steward to have it cleaned out. Each cruise line (and even some ships) have their own peculiarities, pluses and minuses. We have done 2 or more cruises on each of HAL, Celebrity, RCCL and Princess. We have not sailed on Carnival, Norwegian or any of the "luxury" lines or small ship lines, so I won't say anything about these lines. Here are some pointers about what we feel to be pluses or minuses to each cruise line that we have experienced. Princess Plus - Personal Choice or anytime dining. This allows you to dine at anytime, with anyone you wish. You can optionally reserve a specific table as well. The other lines force you to select early or late dining, and you spend the entire cruise with the same set of dinner mates. We've met saome wonderful people from fixed seating, but really do prefer the flexibility of PC dining. Princess Plus - There are generally 2 entertainment venues each night - a large production in the main theatre and a smaller act (comedien, magician, juggler, singer) in the smaller lounge stage. We often don't enjoy the song and dance numbers (much too loud) so head down to the lounge instead. Some Princess boats have Movies Under the Stars (MUTS), so this is a third option. Princess, RCCL Plus - The buffet is self-serve with islands for the different types of food. I'm not a big eater, but like variety. My plate usually consists of small helpings of many different items. On HAL and Celebrity, the staff serves most of the items using ladles that are the size of your plate. Two items and your plate is full! Also, the food island approach allows you to go directly to that second plate refill whereas HAL and Celebrity require you to go through the "cafeteria line" again. Princess Plus - After 5 cruises you get free internet (using the internet cafe computers, not via wireless). After 10 cruises, you get free laundry and dry cleaning. Princess, HAL Plus - All Princess and some HAL ships have coin-op laundrymats on each deck. This is great to be able to wash your gym clothes or iron your dress shirts without paying a fortune. The new Vista class HAL ships do not seem to have laundry facilities. Celebrity Plus - More to come. The following links will take you to Web sites that allow you to research your cruise. There are literally hundreds of such Web sites, but these are the ones that we have found to be the most useful. Cruise Critic - An excellent non-affiliated site for all things cruise related. Especially nice are the message boards that allow you to post questions about any aspect of cruising (and get answers! ), and to meet folks that are sailing with you on your next cruise. CruiseCal - This site gathers up all the cruise itineraries into one big data base and allows you to extract the information in various formats. For example, you can see all the ships visiting a given port formated as a monthly calendar, or see all the stops for a given ship and period, including other ships that are in port with you. Also has links to cvruise lines and cruise cams. Kroooz-Cams - A site that links you to all of the cruise cams out there - both onboard ships and at port facilities.